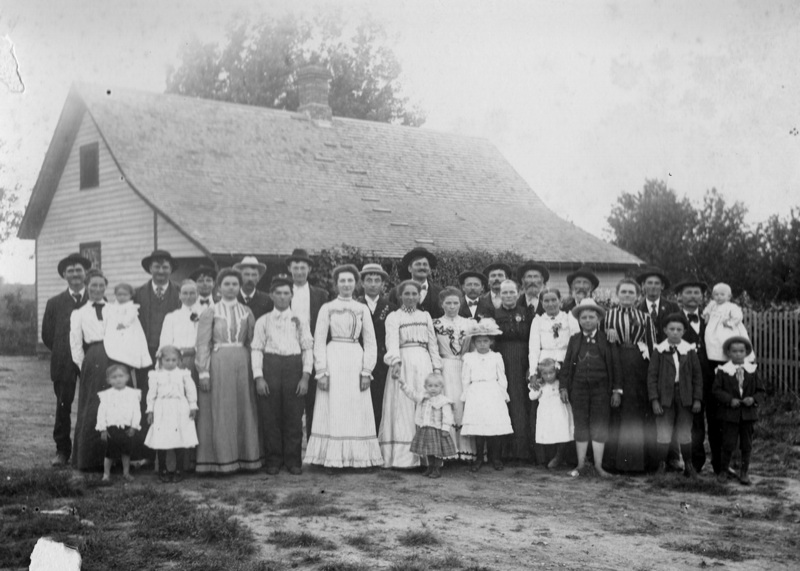 It seems that photographers liked to spread the folks in an array in front of their homes rather than stand them in a tight, traditional group. We have a number of such photographs in our collection. In these photographs, the house is not an incidental background. It is a member of the family, its character as reflected from those old days as that of its family. And the photographer has usually included contextual things in the scope of the photograph. The house puts the people in context, the trees and out buildings put the house in context. Photo 672. 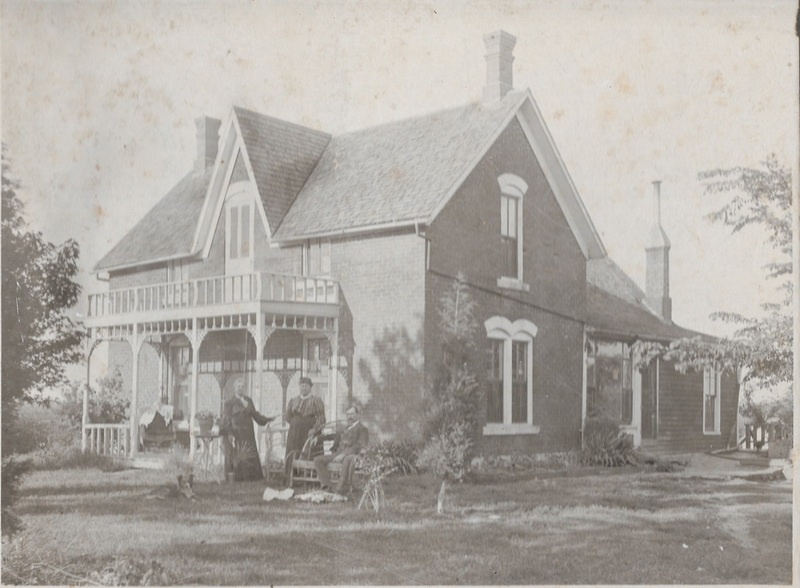 Below is the Purcell family home. On the back is written that this is Mrs. and Mrs. J. H. Purcell, but does not identify the two young men. It notes that the date was "Monday, March 22, 1897." Photo 1816. 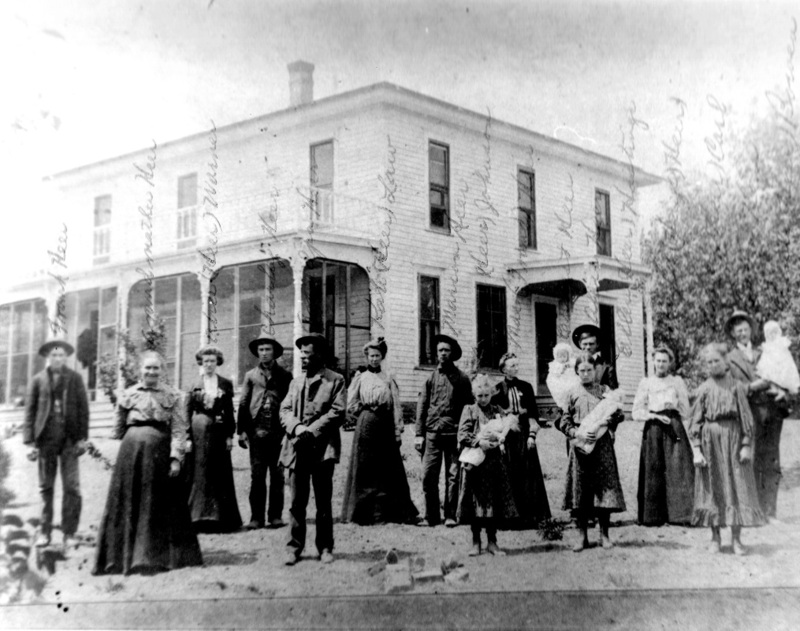 This is the Purcell family home. In this picture are James and Margaret Purcell and their daughter Della Purcell McCoy. And on their left is Bob, the family dog. 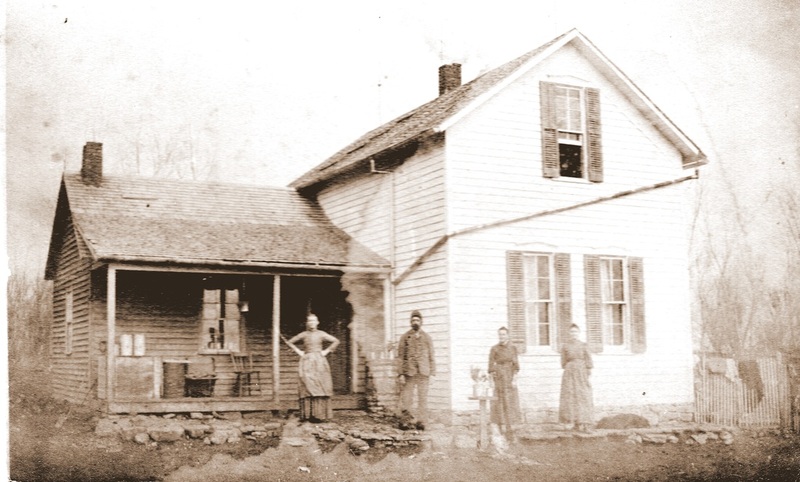 The Purcells were a pioneer family who came here in about 1860. This house was just a bit north of Table Rock. You took the road that goes north from the ball park, over Clear Creek, go up the hill and turn right. The house was back a ways from there. It burned down in the early 1930s. Many people probably remember Fred Muscheites, Jr., who lived at the turn off to the old place. James & Margaret were his great grandparents. Della Purcell McCoy was his maternal grandmother. His parents were Ruth McCoy Muscheites and Fred Muscheites, Sr., who was county clerk for 30 years, were his parents. Another view of the family home, all by itself. 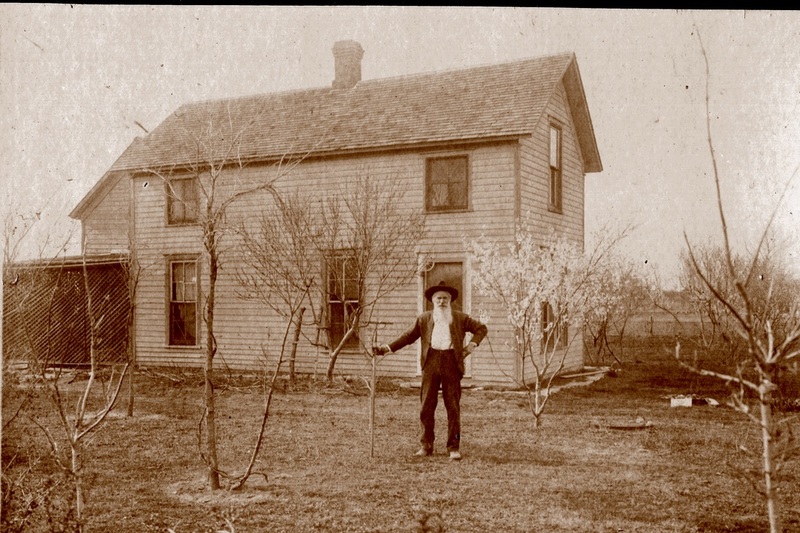 Photo 1331, unidentified elderly man, looks like he has the start of an orchard. 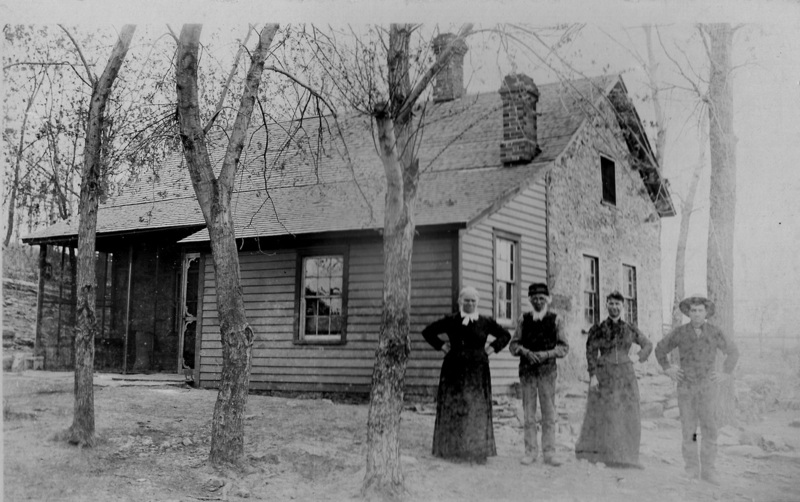 Photo 1517, the Kalina family with their house in the background: Two labels are with it. One says: Anna, Antonia, father Josef, Ed, mother Karolina, “Babicka Paulas”. 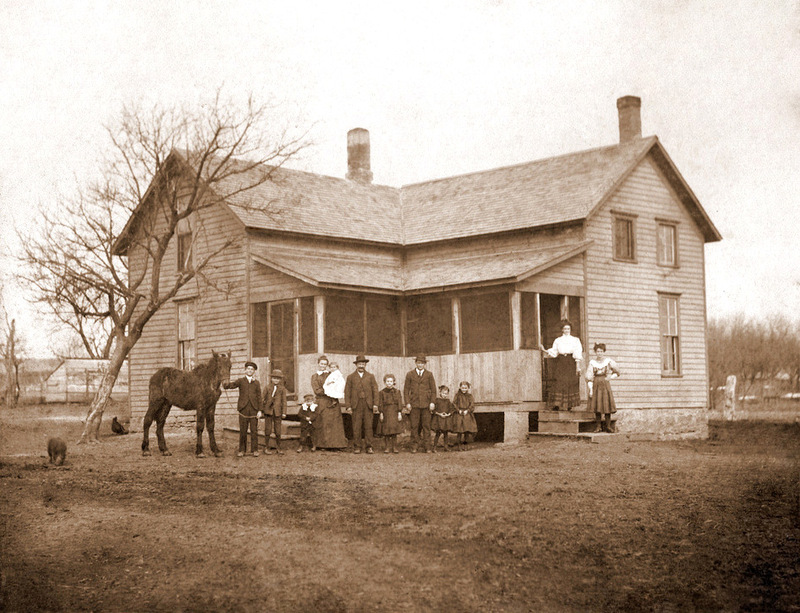 The other says: “The Joseph Kalina farm southeast of Table Rock. Left side of this house was an original log house. Anna (Pochaska) and Antonia (Reiman), Eddie, father Josef, mother Karolina, and grandmother Pavlas. Photo 1508. There is a label affixed to the photo by the Historical Society naming the persons in the photgraph. It appears from that tag that the man on the left is Frank Krofta, Sr. The woman with a child in her arms is Mary Krofta and the child is Henry Krofta. The toddler is Albert Krofta, although the toddler appears to be wearing a blouse and skirt. The man on the right is Anton Krofta. 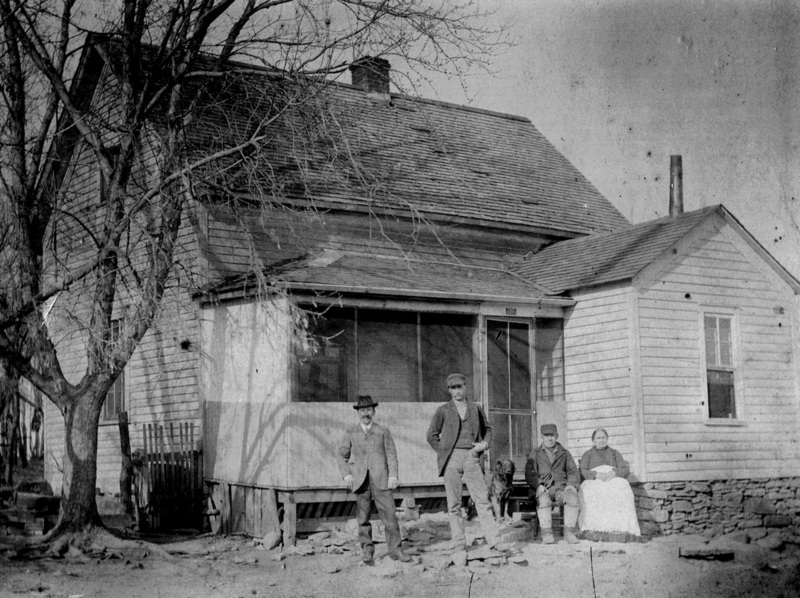 Here is a photograph of the Karas family taken in 1893. From the left is Joseph Karas, Sr., Joseph Karas, Jr., Maria Hana, Joseph Hana, Maria Karas, Emma Karas, and Bohumil Karas. Photo 640. Photo 674, Karas reunion in front of the same house - enough people to hide the house from view! Photo 637, Havel and Barbora Kubicek and son Thomas and Filomena (Minnie) Kubicek. On the back of this photo is a neat little story, which Bob and Fran Blecha think was probably written by Minnie Klapka. Look at those sparkling windows! 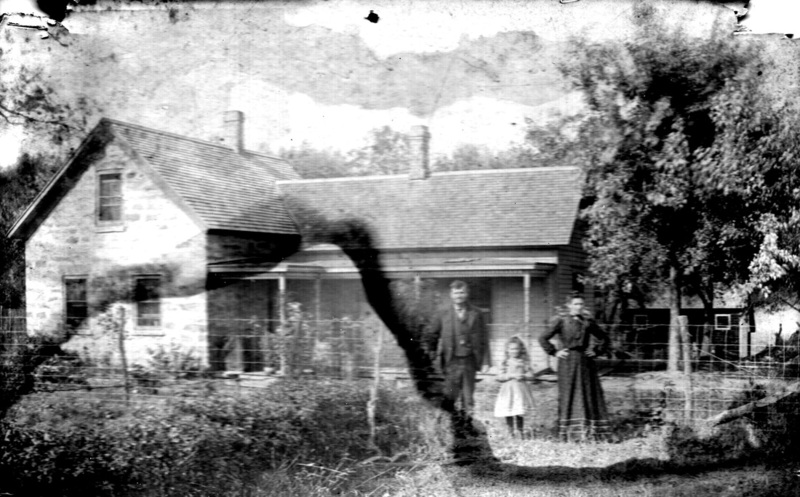 “This picture taken in late 1800s. This picture is of Havel and Barbara (sic, per Frances Blecha it was Barbora) with their son Thomas and his wife Filomina (Minnie) Kubicek. Havel is the father of Thomas. 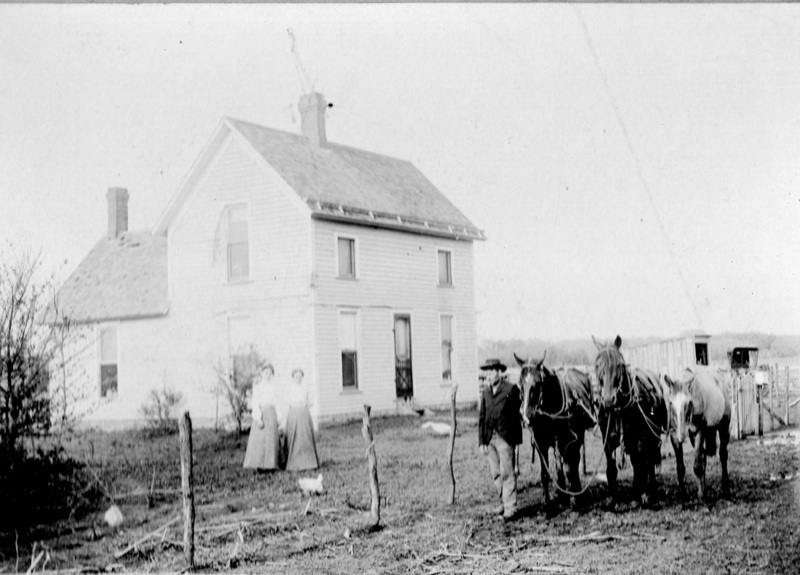 The stone house in background was the home of Havel and Barbara Kubicek, located on 160 acres, homesteaded by them in 1873. 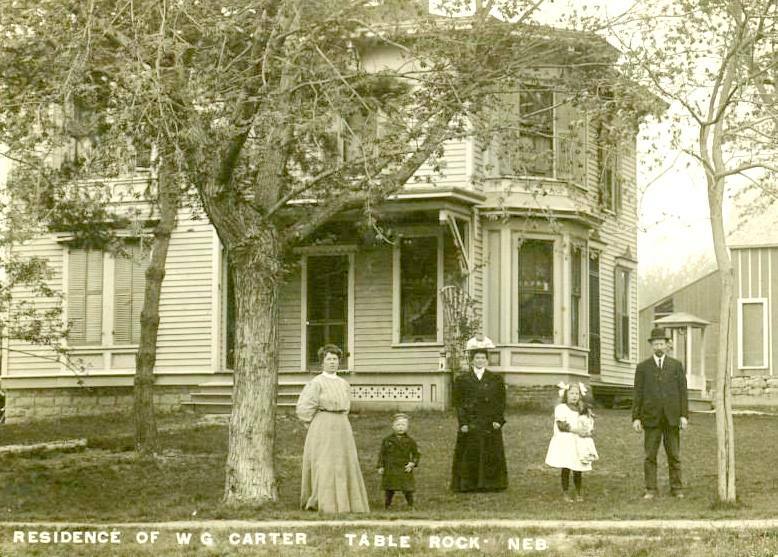 They first lived in a “dug out” and later built the stone house. The old stone house still stands (1980) on a portion of land now owned by Charles Kozak. It is southeast of Table Rock. Havel Kubicek, 1814-1900 and Barbora Kubicek, 1828 – 1904, both buried in Bohemian cemetery east of Table Rock.” Frances Blecha suspects that Minnie Klapka, the daughter of Thomas and Filomina, is the one who wrote this; Minnie was probably was the only person around by 1980 who would know these things. Per Bob, the location of the house is Sheridan precinct, on the east side of section 9 of Sheridan precinct. 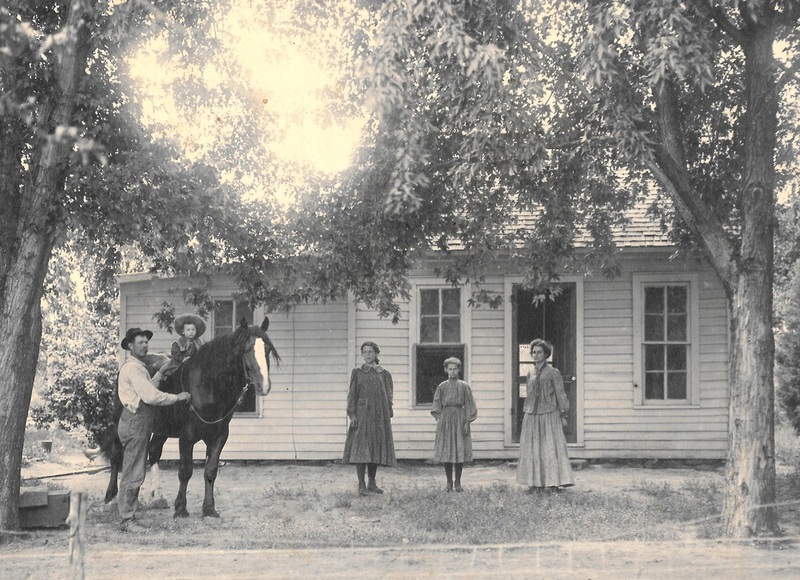 As of 2015, Bob and Frances think this house is still standing. Emil Kozak lived in this house when Bob was a kid, walked to District 51 school. Havel and Barbora were the parents of my great-great grandma Anna Shubert. Her brother is Tom. Anna's daughter Jessie, married my great grandpa Rudy Krofta. Photo 642, an unidentified family. Photo 643 is the Fencl family. Roy Mullin said in a Facebook post that the picture was taken south of the ZCBJ Hall. 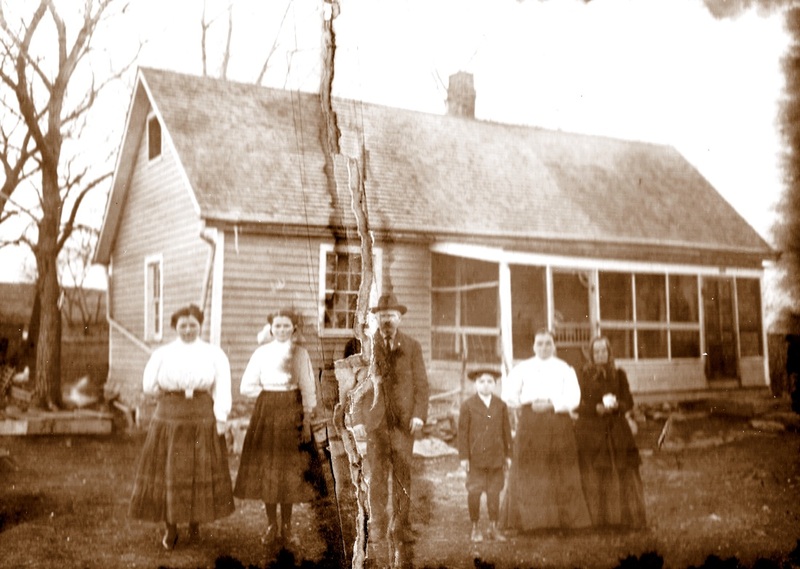 Bob & Fran Blecha have the same photograph; they say it is of the Frank & Celestina Fencl Family. The peope in the picture are: Charles, Albert, Harry, Celestina, Agnes, Frank, Barbara, Will, Bertha, Emma, Rosie, and Mar. Fran says that Frank & Celestina had 12 children. It appears that 10 are in this picture (one daughter, Lillie, died in infancy). 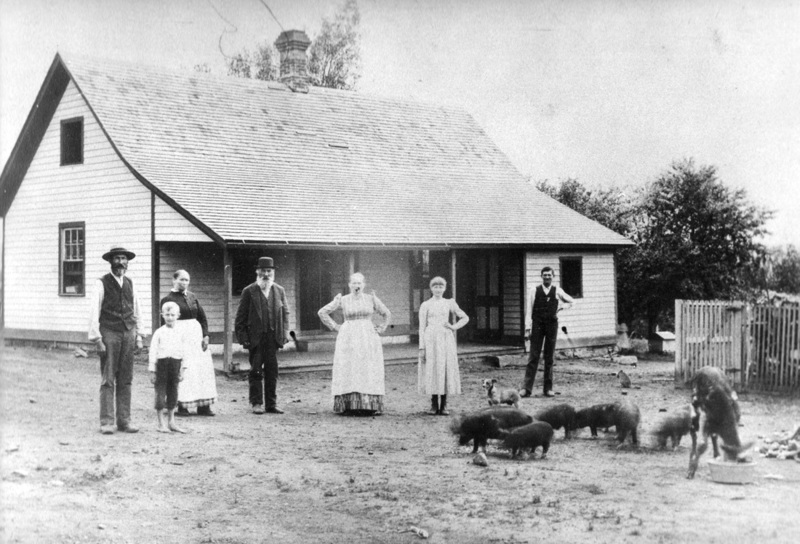 L-R: Charles, Albert, Harry, Celestina holding baby Agnes, Frank, Barbara, Will, Bertha, Emma, Rosie, and Mary. Their youngest, Milton, is not in the photo. Fran estimates that the photo was taken circa 1908, because of baby Agnes. She was born August 9, 1907, and she looks to be maybe a year old or less in the photo. Photo 671. It simply says on the back, "Jack Purcell." Was Jack Purcell passing by, or was this his home? 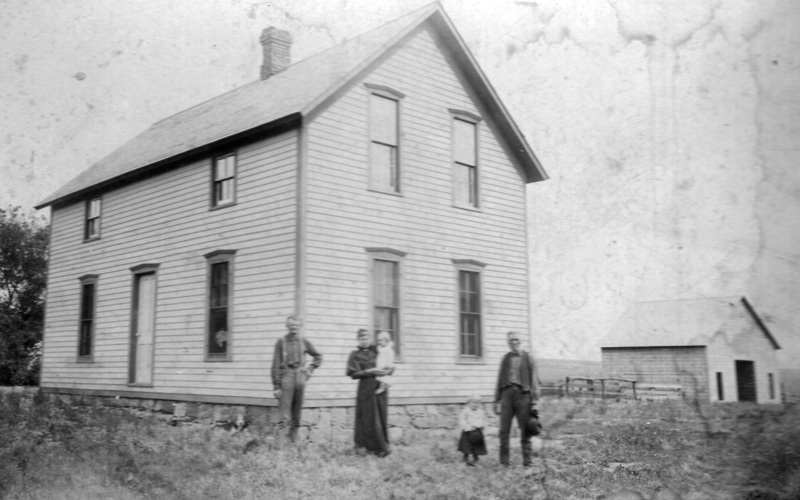 Photo 552, the McCourtney family on June 6, 1907. Here is the "Heer" family. Photo 673. At the bottom it says, "Taken in the Fall of 1902.” Names are written in above each person. Frank Heer, Grandmother Heer, Alice Heer Warner, Charles Heer, Grandpa Heer, Kate Heer Law, Marion Heer, (the little girl: (Annie?) Heer Johnson; Mae _surname here_____ Heer, baby Ernest Heer held by A_____ Heer, girl holding doll is Ellen Heer (Hastings? ), Ma___(Martha) H___ Heer, ____ Heer Carl, _______ Heer, and baby (Pearl) Heer Bowen.” It may be that a family member could fill in the blanks; many of the letters are there but I can’t make sense of them. Photo 986, identified as Charlie Carmichael, his wife, and her sister. This house sat across the street from the old Presbyterian Church -- which was a block north of St. John's Catholic Church. Only St. John's is still here as of 2015. Photo 472, W. G. Carter's house. Photo 512, W. G. Carter's general store. It burned down in the 1920 fire. Standing: Ada Frank Barrett, Arcelia Hall Frank, Mae Frank Heer, "Great Grandpa Hall" (Arcelia's father), William A. Frank. Sitting, Elmer and Ernest Frank and -- probably -- Lou Heer, Mae's husband.